One of the oldest legal newspapers in the United States is publishing its last issue today. 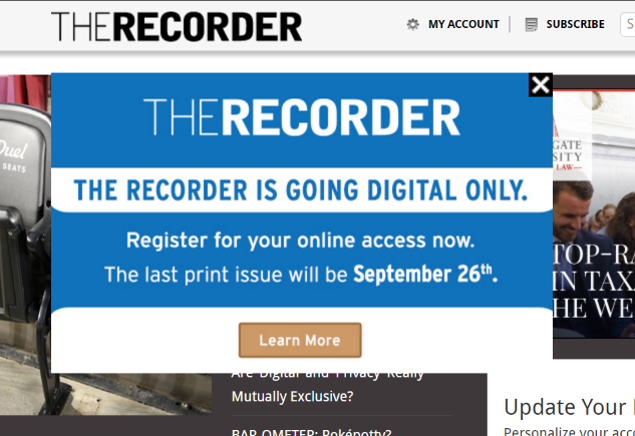 San Francisco’s The Recorder, published since 1857, will exist only in digital format after today’s issue. The Recorder was a daily broadsheet until 2013, when ALM converted it to a weekly newspaper. The digital-only edition will launch Oct. 3. In February, ALM converted InsideCounsel magazine from print to digital only. In April, it reduced the frequency of its Texas Lawyer newspaper from weekly to monthly.